Nearly 200 Arrested As May Day Rally In Paris Turns Violent : The Two-Way A peaceful rally aimed at protesting French President Emmanuel Macron's unpopular public sector reforms was quickly hijacked by black-clad anarchists, who tossed petrol bombs at police. 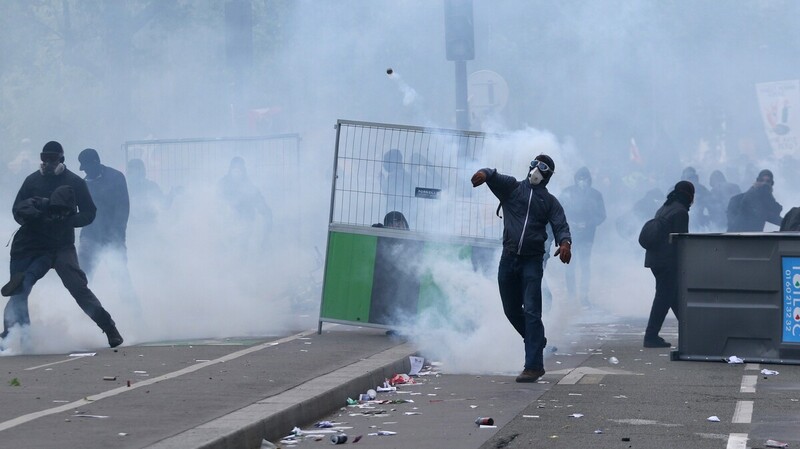 Masked protesters throw stones during clashes with French CRS riot forces at the May Day in Paris. More than a thousand anarchists – many wearing masks and black hoodies — tossed petrol bombs during the annual May Day rally in Paris, as riot police deployed water cannon and teargas. Nearly 200 were arrested. France24 reports that the far-left groups, known as Black Blocs, hijacked a peaceful demonstration to protest President Emmanuel Macron's unpopular public sector labor reforms. The groups "have waged heavy property damage on local businesses," the news website reports. The march began from the Place de la Bastille – the site where the French Revolution began – south toward the Place d'Italie. However, according to France24 "... the march was slowed to a halt by a large group of demonstrators clad in black, with many wearing balaclavas and some with gas masks, who broke into a chant of "Everyone detests the police" on the Austerlitz bridge across the Seine. The Paris police prefecture estimated the size of the group at 1,200 so-called "black bloc" protesters. "When you have sincere convictions, you demonstrate with your face unmasked," government spokesman Benjamin Griveaux said, criticizing the protesters' decision to cover their faces. "Those who wear hoods are the enemies of democracy." Macron's government has announced plans to cut more than 100,000 public-sector jobs and to link pay raises to job performance. "There is widespread discontent in labour unions over Mr Macron's reforms. Rail staff have begun three months of nationwide strikes over a planned overhaul of state-run railway SNCF. Unions said the number of peaceful protesters at the main demonstration on Tuesday was about 55,000. Police put the number lower, at about 20,000."